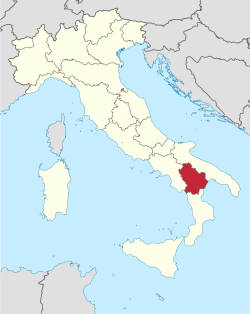 Basilicata(Italian pronunciation: [baziliˈkaːta]), kent as Lucania an aw, is a region in the sooth o Italy, borderin on Campanie tae the wast, Apulie (Puglie) tae the north an east, an Calabrie tae the sooth, haein ane short soothwastren coastline on the Tyrrhenian Sea atween Campanie in the northwast an Calabrie in the soothwast, an a langer ane tae the sootheast on the Gulf o Taranto on the Ionian Sea atween Calabrie in the soothwast an Apulia in the northeast. The region can be thocht o as the "instep" o Italy, wi Calabrie functionin as the "toe" an Apulie the "heel". The region covers aboot 10,000 km2 an in 2010 haed a population o aboot 600,000. The regional caipital is Potenza. The region is dividit intae twa provinces: Potenza an Matera. Wikisource haes the text o the 1911 Encyclopædia Britannica airticle Basilicata. This page wis last eeditit on 3 Juin 2016, at 23:40.